Hallasgo, Tadlas Best of MILO Butuan | JustRunLah! BUTUAN CITY – The penultimate qualifying race for the 41st National MILO Marathon was completed Sunday (November 12) at the Father Saturnino Urios University Gym with familiar faces sharing podium honors. Bobby Tadlas recaptured the title he last held in 2015 while Christine Hallasgo completed the double conquest by their team the Malaybalay Runners. 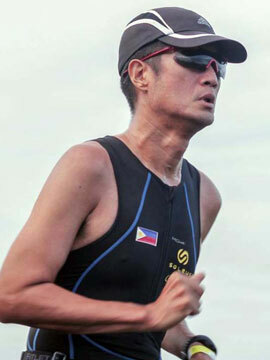 Tadlas, who qualified last season via winning the Tagbilaran leg, clocked 1:13:31 over the 21-kilometer course. Coming in Second Place was Jemarwin Cabran (1:18:31) followed by Alvirg Busa (1:21:18). Hallasgo, a back-to-back champion of the Cagayan de Oro leg in 2014 and 2015, tasted success again with a time of 1:30:45 that is good enough to land her among the Top 10 of the Men’s Division. She was clearly the runaway winner against Janette Mendoza (1:47:59) and Jaylou Maloloy-on (1:51:27). Tadlas and Hallasgo will lead the city’s qualifiers to the National Finals set for December 3 in Cebu City. Tadlas hopes to improve on his 18th Place finish in last year’s Nationals hosted by Iloilo City. In the other distance categories, the 10 kilometers was won by Ruel Alguffera (35:03) and Lovely Andrin (45:36) while the five kilometers went to Rico Jay Patanao (17:22) and Afjeel Clampiano (22:34). The three-kilometer children’s race was ruled by John Paul Esoro (11:43) and An Mansacoban (13:33). The MILO Marathon will hold its final qualifying race this Sunday (November 19) at Cagayan de Oro. This will be the last chance for runners to earn slots in the Philippines’ oldest and most prestigious footrace.